If you ask me, waking up in the morning is the absolute worst! Does anyone else think that waking up is something that should be put off as long as possible? I love me a good sleep-in session! 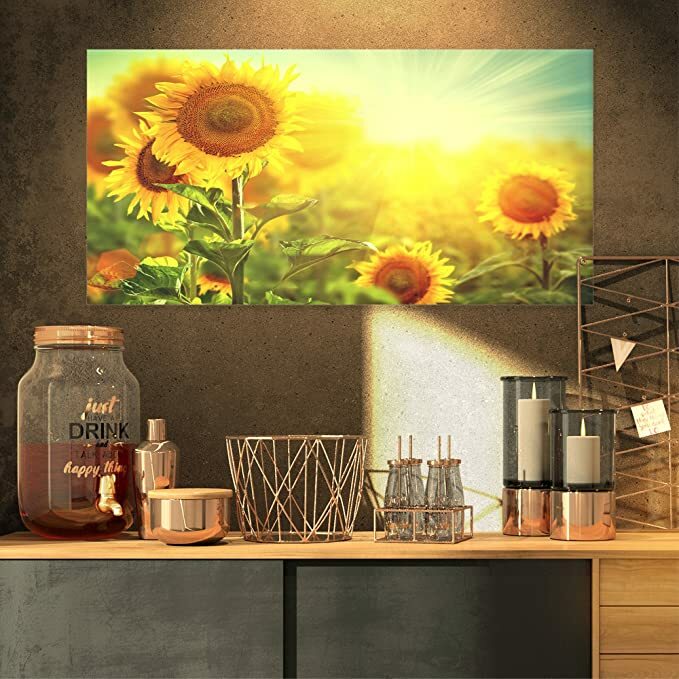 Make your morning a little easier with some sunflower-themed photos for the kitchen. They’ll brighten up your breakfast, which in turn brightens up your entire day! 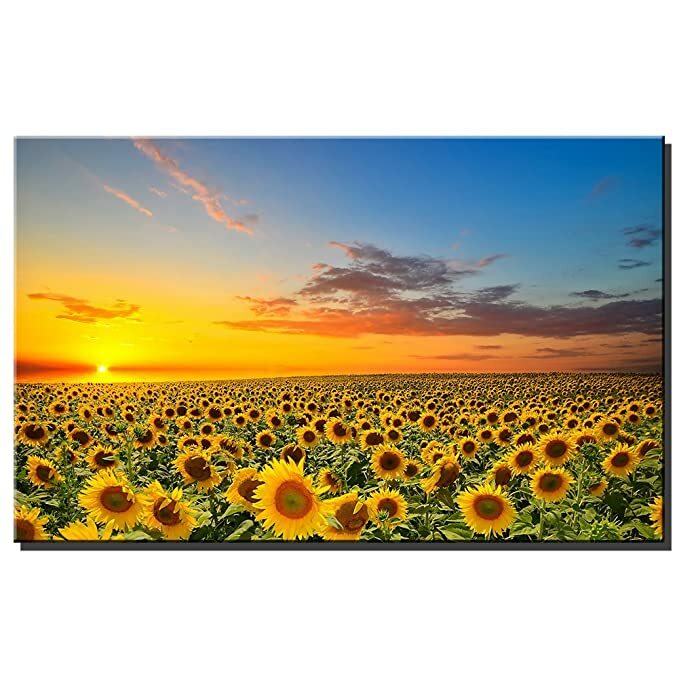 Click the links to purchase these adorable sunflower field pictures. You’ll love how they make your home look! This is not a sunflower idea..but I love the artwork nevertheless! 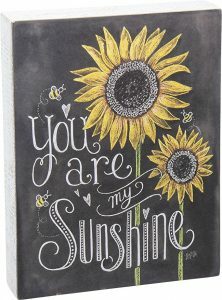 If you love the look of a classic farmhouse sign, but find that your own artistic abilities may be lacking, hang this sunflower artwork up in your kitchen! It reminds everyone in your household that they are loved and it is the perfect farmhouse accessory. What a win, win! Speaking of rustic, there’s no better way to bring that vibe to your kitchen than with a piece of sunflower artwork made from wood scraps. Buyers should be warned that this is a relatively small piece of artwork, so don’t expect a gigantic mural when you order this! That being said, I love it regardless of its size: it looks great propped on a countertop on an odd-sized wall! What better way to wake up than with a cup of coffee and a bright piece of artwork. This is my favorite artwork piece featured because it looks like both a photograph and a painting. Keeping with that farmhouse theme, this large sunflower tapestry is sure to wake up even the stragglers every morning. It’s not quite a sunflower field, but I think that a group of sunflowers could qualify, right? Though this 5-panel mural set isn’t displayed in the kitchen of this home, it looks absolutely lovely, regardless! This inexpensive mural set is just the thing you need to make your home look cheerful and welcoming. 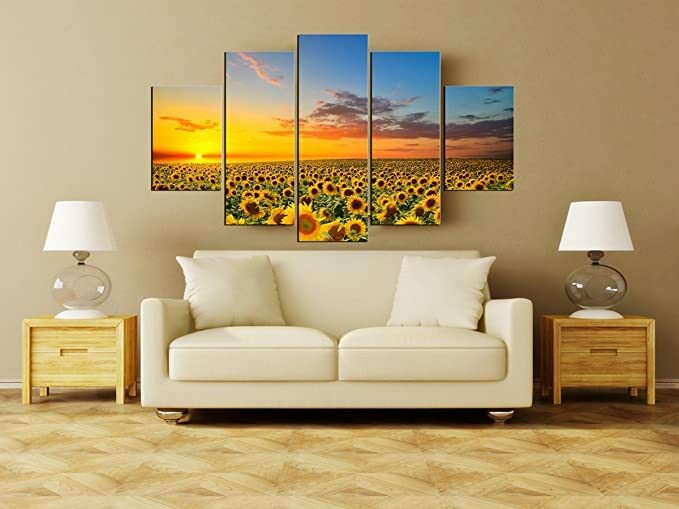 For me, this wall art depicts the very image I imagine when thinking of a sunflower field. The stunning colors found within the sunset would look great against any kitchen wall. If there’s one thing that’s sunny-side up, it’s this mural below!